These three musical autographs, inscribed completely independently of each other, together give us a powerful reminder of the path on which we Violinists can choose to walk. 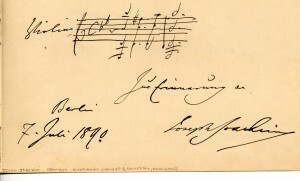 The first autograph is from Joseph Joachim, two measures of his own music. We know him as Brahms’ friend, confidant, and a composer in whose creative powers Brahms had great belief. Significantly to us as violinist though, he accomplished a truly amazing transformation of live concert music in his time. When he was a young man salon music (pieces short, sweet and virtuosic) was very much in vogue; the general consensus then was that people just did not have the concentration for listening to music such as the “lengthy” and “serious” works of Beethoven and Bach in recitals – they supposedly had very short attention spans – !!! (Does this sound familiar to any of you readers?) Joachim proved that these so called “serious works” could not only keep the audiences engaged, but give them a truly transformative experience. The second autograph comes from Henri Vieuxtemps, the violin virtuoso and composer who taught Ysaÿe and of whose playing Schumann said “…from the first note to the last he holds us in a kind of magic circle that encloses us, where one can find neither beginning nor end “. 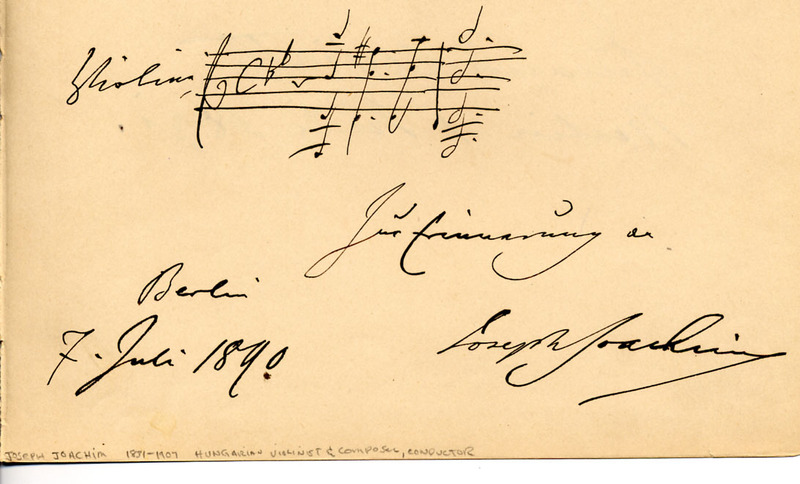 In this autograph he inscribed the opening phrase of the Archduke Trio (Beethoven Op. 97)! When I first saw it, this struck me as his saying that virtuosity must always serve Art. As I looked into the matter further I found that this was not only his specific and dedicated artistic viewpoint, but that his viewpoint was profoundly shaped by his close association with the Viennese musicians from Beethoven’s circle, in the years after Beethoven’s passing in 1827. He was the first violinist to perform the Beethoven Concerto after his Beethoven’s death, in Vienna, 1834 in the Musikvereinsalle, to great acclaim. The third autograph is Eugene Ysaÿe’s inscription of the opening measures of the Gigue from the D Minor Partita for Solo Violin of J.S. Bach, the “brook” or”source” from which so much of our Classical European tradition comes. For many, Ysaÿe exemplified the highest blend of virtuosity, artistry and totally compelling performance. He constantly focused his students’ attention on the singing musical line: “Le chant, le chant!” he would shout. Many of you may also know that Ysaÿe was a dedicated beleiver in the works of new composers, and composed himself. He was a devoted chamber music player: the Debussy Quartet was written for him and his quartet, as well as César Frank’s Violin Sonata. I find that these three autographs form an organic, inspirational trio. All three were performers and composers, all synthesized the internal strengths of our art with the most significant creative impulses of their time. They define the philosophical and practical essence of my Violin Studio.